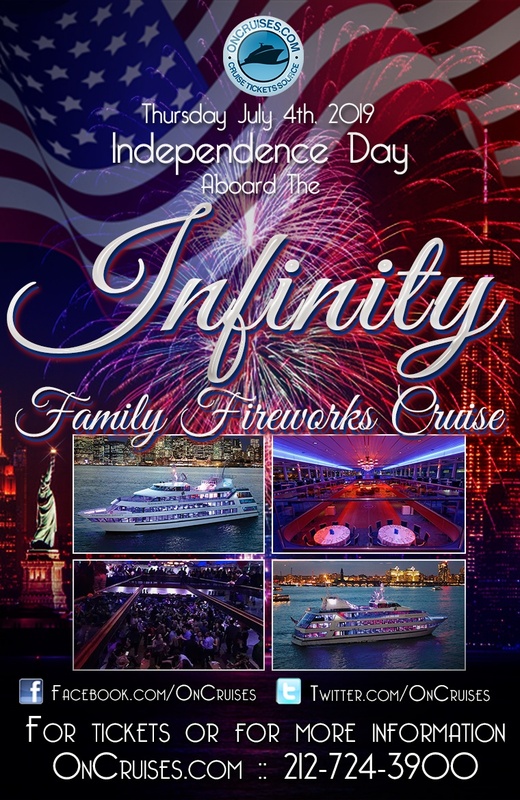 The Infinity Yacht welcomes you aboard for a family-friendly July 4th celebration like no other. This July 4th NYC cruise is going to take you around the city aboard this luxurious and spacious yacht for the perfect July 4th family celebration. Your night is going to be filled with the top music of this year, a delicious dinner, nonstop drinks, and a view of the fireworks you don’t want to miss! When the fireworks begin this year where will you and your family be watching? If it’s not on this July 4th NYC cruise, then you definitely are missing out! Bring your family on board the Infinity Yacht this year and watch as the sights they see amaze them. From the yacht itself to the views of the city you’ll receive, celebrating July 4th at sea will seem like the new norm. The Infinity Yacht is built to keep your family comfortable and entertained for your entire sail. Three climate-controlled decks with custom LED lighting and state-of-the-art sound systems are present throughout the entire yacht. Take a look at the city from the exterior deck of the yacht and view the city skyline with your family. The views of the city will amaze you as you watch each landmark pass you by. The Statue of Liberty, Ellis Island, the Freedom Tower and much more will be right in front of you to enjoy and snap pictures.Now, this July 4th NYC cruise is going to keep you dancing on one of the five dance floors on board. Spinning the hottest tracks from the Top 40, Hip Hop, Dance and Pop charts will be your live DJ. Grab the family and get those bodies moving to the sound of your favorite songs! Share a meal with the family with the full dinner buffet on board. The Infinity will be serving delicious dinner options that are for sure going to please the family. Guests 21+ will be able to participate in an open bar for the entire sail. With bars on board, getting your favorite drink won’t be as hard as you think. Completing this experience is the amazing view of the Macy’s 43rd 4th of July Fireworks Spectacular! When all eyes are looking to the sky for the fireworks, where will you be this year?